Bob Bannon and Pat Bayless of County Line Nissan in Middlebury, Conn., received a 40-year award for Nissan from Nissan North America. Greg Semel, right, of Billco Motors in Wexford, Pa., receives a 50-year award for Volkswagen from Stuart Karp, director of Volkswagen of America's central region. 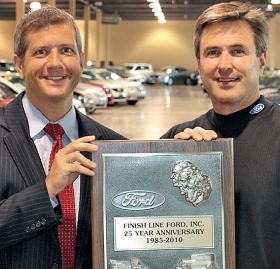 Jeff Green, right, of Finish Line Ford in Peoria, Ill., receives a 25-year award for Ford from Mike O'Brien, Ford Motor Co.'s Chicago regional sales manager.